Welcome to Golfview Resort, the perfect golfers’ getaway in Pigeon Forge, Tennessee. The area surrounding the Resort has so many golf courses that you could play a different course every day of your vacation. Didn’t bring clubs, no problem the resort has four sets of golf clubs guest can use free of charge! 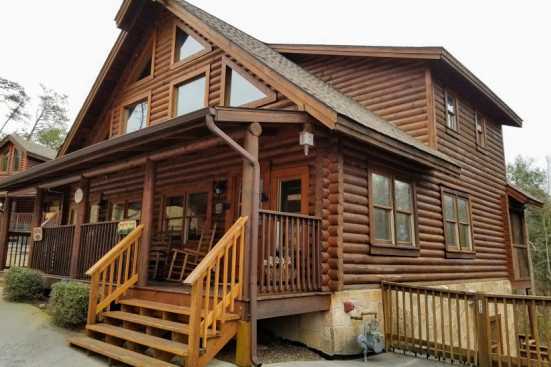 The cabins offered are two and three bedrooms and can comfortably sleep up to thirteen adults. Amenities for the cabins and surrounding resort area include an indoor pool, jacuzzies, large outdoor decks, wifi, and a stocked workout facility. Hitting the links around Golfview Resort is a one of a kind experience. Imagine golfing while taking in breathtaking views of the Smokies and local wildlife but still only being minutes from your private cabin. After a few days of golfing consider heading up the road to the famous Smoky Mountain National Park. Smoky Mountain National Park is a world-renowned wildlife preserve boasting breathtaking mountaintop views and hidden waterfalls tucked in a beautifully aesthetic location. SmokyMountainsByOwners.com is the perfect destination online to find, book, and plan your Pigeon Forge, Tennessee vacation. From a large variety of sprawling golf courses to the breathtaking wildlife and scenic mountaintop views Pigeon Forge and Golfview resort has fun and adventure sure to delight all your family and friends.